Improve your English Speaking – Listening – Reading – Writing – Numeracy – ICT skills and more! Our classes are small and friendly. As a student with PRACE you will enjoy the benefits of belonging to a vibrant and welcoming community. Enrol any time – we have ongoing enrolments throughout the year. Fees are calculated according to enrolment start date. Call or visit us to schedule a placement interview. You may be eligible to access FREE classes through the AMEP or SEE Programs. AMEP provides English as an Additional Language classes (510 hours) for eligible people recently arrived in Australia as migrants or refugees. Childcare is available if required. 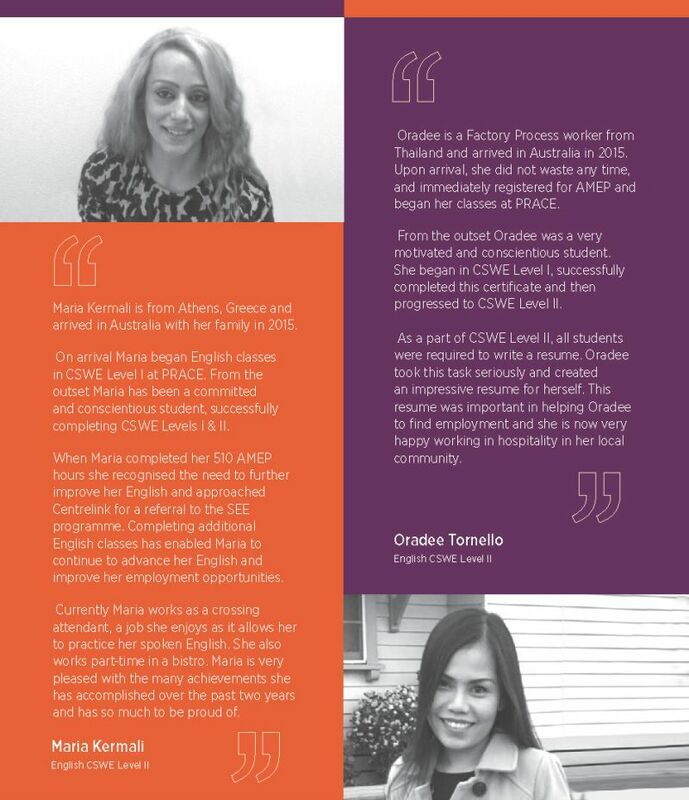 PRACE is a member of the Melbourne AMEP. The Adult Migrant English Program (AMEP) is funded by the Australian Government Department of Education and Training. PRACE provides English and Literacy classes to eligible clients referred by Centrelink or Job Services Agencies. 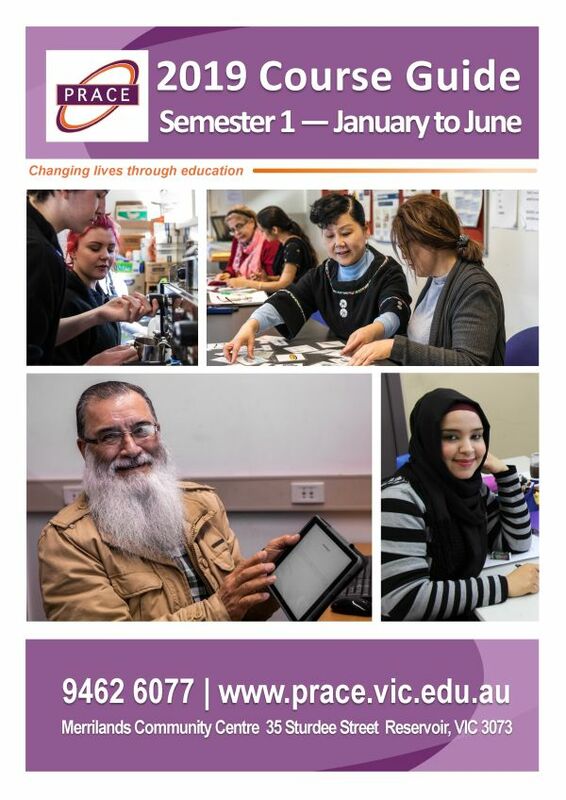 The State Government of Victoria provides subsidised training under the Skills First Initiative for PRACE English language courses. Tuition fee calculation is based on regulatory requirements for fees for government funded training in Victoria. This is determined by Skills First. All courses are subject to eligibility requirements. Please contact PRACE for more details. Please note: the Student tuition fees as published are subject to change given individual circumstances at enrolment. You may be eligible for a government subsidy for your course. The Victorian Training Guarantee makes vocational training more accessible to people who do not hold a post-school qualification, or who want to gain a higher level qualification than they already hold. You can check your eligibility using The Victorian Skills Gateway Eligibility Indicator. You are eligible to commence a maximum of two subsidised courses at the same qualification level in your lifetime. This restriction applies whether or not you complete the course. Also you are eligible to commence a maximum of two government subsidised courses in any calendar year as long as you are not doing any more than two courses at any one time. Concession student holds current concession card and is eligible for a Skills First subsidised training place. Full Fee student does not hold a concession card, but is eligible for a Skills First subsidised training place. Fee For Service student is not eligible for a Skills First subsidised training place. Fee exemptions are available for financial hardship. A Service and Amenities Fee (SA) of $10 Concession & $25 Full Fee applies to all courses.